At Majestic Medical Inc. the full restoration program is designed to bring your instruments back to “like new” condition, or as close to “like new” condition as possible without jeopardizing the integrity of the instrument. The first step in this process is refinishing the instrument. All difficult to reach areas of the instruments are cleaned using a special technique which removes rust, discoloration and any deposits that may have accumulated during normal use. Next the exterior of the instrument is refinished. The three most popular finishes used on stainless steel instruments are a high luster polish, a satin finish and a matte/low glare finish. During the refinishing process, extra care is taken not to remove any manufacturer information or catalog numbers that may be on the instrument. The second step in the restoration process is to ensure that each instrument is in perfect or as close to perfect working order as possible. Each instrument is sharpened, aligned, welded, soldered etc… In some cases new parts such as carbide inserts, screws, springs, nuts, bolts, etc… are needed to ensure proper functionality. At the end of this step the repair of your instrument is complete. Next, all instruments are cleaned in a high temperature ultrasonic cleaner so as to remove any residue that may have accumulated during the restoration process. The instruments are then sent to our quality control department, where each instrument is inspected to ensure that they function properly, have a “like new” appearance and meet our stringent specifications. Your instruments are then carefully packaged and returned to you or your facility where they will perform as if you had just purchased new instruments. Majestic Medical Inc.’s economy repair program is designed to ensure that your instruments are functioning properly. It is customary for medical facilities to send instruments in for an economy repair as a follow-up to a full restoration on high use trays. The economy repair program also offers an economical means for your facility to ensure that all instrumentation is in perfect working order during times of budgetary constraints. During an economy repair, all instruments are cleaned in a high temperature ultrasonic tank, in order to remove rust, discoloration and deposits that may have accumulated during normal use. ( Note: This process will improve the appearance of each instrument, however it will not achieve the “like new” appearance that is achieved during a full restoration repair). Next, each instrument is returned to perfect or as close to perfect working order as possible. 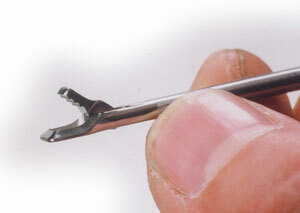 This consists of the sharpening, aligning and the repair of any major flaws of all instrumentation. The instruments are then cleaned again in our high temperature ultrasonic tank in order to remove any residue that may have accumulated during the repair process. 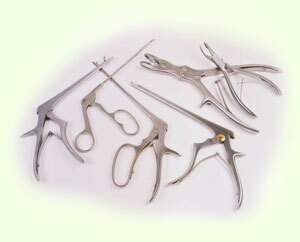 The instruments are then sent to our quality control department, where they are inspected for functionality. Once they have been approved by the quality control department, they are carefully packaged and returned to your or your facility in perfect working order. 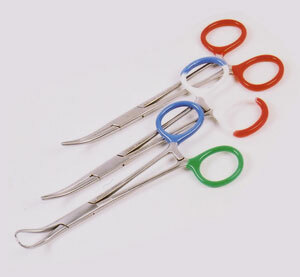 Majestic Medical Inc. currently offers two forms of color coding (dipping and taping). Both color coding systems are designed to provide central supply and operating room staff with a fast and easy way to identify surgical instruments and instrument trays. Either of these identification systems will be helpful if you are trying to organize your instruments by tray type, surgeon, operating room or in any other way that you desire. Using a specialized technique, Majestic Medical Inc. technicians will apply a colored coating to an appropriate area on your instrument, in order for you to easily organize and identify your instruments or instrument trays. This coating forms a hard shell and adheres to the instrument. 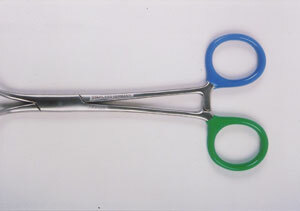 It is extremely durable and will withstand repeated sterilization processes. Majestic Medical Inc. currently offers 17 different colors, which will provide you and your facility with a wide range of color combinations. It is important to note that some instruments are not suitable for this process. When it is determined that the application of a colored coating could negatively effect the performance of an instrument, another form of instrument identification may be recommended. Our Quality Control Department inspects all instruments that have been color dipped in order to ensure the highest quality for our customer. Majestic Medical Inc. keeps a large inventory of color coding tape in stock to help you organize and identify your surgical instrumentation. All tapes that are used by Majestic Medical Inc. are specifically designed for use on surgical instrumentation and are suitable for the sterilization process. Our large inventory of colors allows for almost any color combination. Our quality control department inspects all instruments that have been color taped in order to ensure the highest quality for our customer.